BAREBOW! - Bow Hunting by Barebows! BAREBOW! is a personal account of Dunn’s 40-year odyssey to harvest all 29 huntable species of big game in North America, ranging from Whitetail Deer to Tule Elk to Grizzly Bear. In hushed tones of awe, patience and appreciation, Dunn takes his readers into the wild and woolly wilderness areas of North America. Remarkably, Dunn’s odyssey began as an unmentored boy’s interest in archery. His dream of joining North America’s elite bowhunting fraternity of those who have taken North America’s Super Slam would come much later. 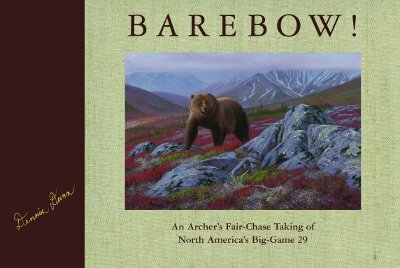 In BAREBOW!, outdoor writer Dennis Dunn teams up with two renowned wildlife artists, Hayden and Dallen Lambson, to produce an eye-catching and stirring account of North American wildlife, their habits and habitats, and the enduring connection made by one man in tracking, hunting and harvesting the North American Super Slam with a bow and arrow. Breathtaking in its illustrations and spellbinding in its storytelling, BAREBOW! is the must-have addition to every hunter’s den, great room, or bedside table. Read the Preface to BAREBOW! in PDF format, suitable for printing.